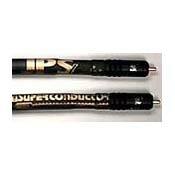 I used JPS Superconductor 2 XLR and RCA for over 5 years with B&W 805S and solid state devices. They're coaxial cables with center conductor made of copper-clad aluminium, foam polyethilene dielectric, thick copper tube as shield and a carbon loaded external jacket; the balanced version use two coaxial for channel, with terminations.These cables need a minimum of 400 hours of burn-in (it's insane, but true), 'cause earlier they sound bright and thin. Once settled, they're warm, with great bass and midbass, round midrange and silky highs. Less warm respect to some Cardas cables, but much more dynamic and 'live'. What I prefer of these cables is their ability to give to the listener the right emotions with every kind of music. Now (2016) there are cables with 7N occ copper and teflon dielectric that sound much more detailed, with better tridimensionality and frequency extension, but the JPS SC2 are one of the few cables that always make me forget the audiophile parameters to feel in love with music. Detailed without becoming analytical. Probably one of the best interconnects around. I had auditioned quite a few cables over the years when I settled for the Cardas Golden Cross interconnects. Though these are good interconnects they still had me wanting. Beautiful warm and round sound, but lacking in detail so I guessed I couldn't have best of both worlds. Then an audio dealer I know well handed me a pair of Superconductor2 interconnects, while warning me that I would take a bit of burning in. And they did! Though they didn't sound awful, they couldn't beat the Cardas Golden Crosses either. But after a week they really blossomed to their full potential. The same roundness, depth and warmth of the Golden Cross but with all the fine detail that was I missed before, it seems best of both worlds does exist after all. It sailed through the blind test without a problem (I do this to every change in my system, if I can't pick the new addition blind it doesn't stay) and looks (or better: sounds) like this interconnect will be around in my system for a long, long time. Dynamics and power to die for, very even tonality, great detail. My last set of cables! Stiff cables, but you can bend them into nearly any shape. 2 years were spent trying various interconnects and speaker cables. These were times of discovery, amusement, and frustration. After trying various levels of Kimber, Transparent, MIT, Van den Hul, Acoustic Zen, Nordost, and others, I decided to try out JPS Labs. My fist try was their original Superconductor series. I fell in love with the very even rendition from lows to highs. Everything was in its proper place with all of the detail portrayed even in very complex segments. The dynamics were stunning. The distant soundstage that Transparent presented was brought up closer and I finally became part of the music. Now, I listen to a lot of musical variety: blues, jazz, reggae, hard rock, old school heavy metal, SKA, classical, acoustic guitar, almost anything. JPS cables are the first cables that work great with everything I throw at them. I saved up some scratch for starting the upgrade to Superconductor 2. I bought a pair of the speaker cables, jumpers, and an interconnect. At the time, I was running a Shanling CDT-100 directly into my Krell FPB600 and running B&W 801 Matrix 2 speakers. When I first heard the SC2s, I was blown away. Although the detail of the new cables was only about 15% better, the dynamics were scary. Hit play and out of the silence a snare drum can literally knock you out of your seat. The rise times of snares, cymbal hits, plucked strings, etc. are so fast and real that you are really there. 90 minutes and you walk away satisfied and drained from all of the emotion of what just happened. Other cables and you sit and search for things to notice in the music. The SC2s let you just relax and let the music come to you. The feeling of Regae or SKA basslines running up and down your spine had me sold on JPS Labs. As long as your equipment is good enough to warrant the SC2 cables, try them. You will lose all the wander-lust of trying other brands again. These are going to be the last cables you buy. If you can't justify SC2 costs, then try a used set of the original SC or the new SCFX. I have tried them all, and any JPS cable is well worth it's price. Kimber Kable, Transparent, MIT, Van den Hul, Acoustic Zen, Nordost. Dead Quite Background very transparent without being bright balanced from top to bottom. Music sounds so real and natural. very stiff but still worth it. Installation must be thought out because the cables must not be bent at acute angles. These cables work well with my Audio Research LS25 Ph3SE and VT100MK2. The noise floor is extremely quite the highs are nice and clear without being harsh. Background vocals and instruments are clear with proper spacing and timing. Very musical cable works great with my analog front end Linn Sondek LP12 Ittok Lyra Evolve hooked up with a cardas tonearm cable adapter. I don't know nearly enough about electrical theory (or audio, for that matter) to embarrass myself dissecting the sonic merits of the Superconductor 2's. What I will say, though, is that these cables have made it gloriously easy for me to sit back and enjoy my *very* modest system. Rather than dissecting whether the midrange is sweet enough, or wondering if the highs are extended enough, I just groove. That's probably the highest compliment one can pay to a cable. While not exactly bargain-basement blue-light specials, the Superconductor 2's deliver a freighter-load of performance for the price. As with everything else, sure, there's bound to be something "better" out there, but I'd bet the farm that most people would be forced to prostitute themselves to afford it. These cables do absolutely everything right: no coloration, no noise, just music. In my misguided search for audio "nirvana," I've made a ton of mistakes and taken some bad falls, but these cables make me feel like a Mensa-grade genius. Relax, enjoy, and be a proud owner. Neutral balance, detailed mids, smooth highs, excellent bass. Stiff as a board, can topple light weight components right off the shelf. I had bought this cable out of curiosity only. I had read all the glowing reviews on the JPS website and thought I ought to give them a try. I hooked it up between my Marantz CD63SE and Bryston BP25 preamp. The music just came through without any colouration. Neutral balance, natural vocals and smooth top end without glossing over detail. I've since upgraded to a Theta Miles CD player and the system really sings. The spacial resolution is first rate and the bass is tight and fast. Curiosity is a good thing because I have never enjoyed my system more. Cables are a very controversial audiophile subject but to my ears they make a huge difference. These are real serious cables and they're not too pricey. If music is as big part of your life as it is ours then you should check out the JPS Labs Super 2, they are worth every penny. 5 stars for value and 5 stars overall. I've been to the audio stores and have heard most of the megabuck cables and this one is truly as good as any. My initial experience with JPS interconnects and speaker wire was astonishment at the results of wiring a Bryston B-60 to an Ultech UCD-100 CD player with B&W DM302 speakers with JPS super+. I instantly realized the need to purchase the super 2 cables for my reference system, which was connected with Kimber KCAG interconnects and 4AG speaker wire. Although I cold live with the Kimber, the JPS super 2's truly conveyed what the equipment was capable of in a manner I had not realized or thought possible. I am still being surprised by what I am hearing after six months of diverted listening. When words become inadequate to describe this experience, the music exhaustively portrays it. Listen and you will hear what I mean. Stiff and hard to route. Short and to the point, I have worked my way up from the Ultraconductor, Superconductor, Super+ and now the Super2. I have tried many ICs in between on many different systems, but seem to always return to the JPS. They are just correct. The gain from the + to the 2 is about 20%, and to me this is worth the extra cost. Cardas, Magnan, Silver Audio, Concident and many others. Very open, detailed, and warm midrange. Awkward to manuever. Not a cost for everyone. I purchased (2) 1 METER PAIRS, AND (1).75 METER PAIR over the year 2000. I purchased pair one at a time. I used them CD direct to amp, then just preamp to amp. Then between CD to preamp, and preamp to amp. System components, Wadia 860X, Presence Deluxe (tube) preamp, Blue Circle BC-6 amp (tube hybrid), Tandberg 3014 tape & 3001A tuner, Gensis 500 subwoofer (15"/500 watt) subwoofer,Merlin VSM speakers, LAT Int'l SS1000 speaker cables. I use a MusisCap in line in the amp, rather than a crossover the highs to the Merlins. Awkward to manuever, you need some rome behind and around the equipment. I had NEAR 50ML's, a First Sound Passive Preamp (puer passive premap with stepped attenuators made by Presence Audio listing at $2600), and Forte 1a (parts upgraded amp) 50 watt class A amp. I decided to upgrade my system a component at a time last year. These cables were partially used with the older gear in progression. I had used many interconnects throughout the 1990's. I love the Magnan Vi midrange. This was reference midrange for an affordable interconnect in my budget. I thought the extenstions were a little limited. Soundstage was very good, not always the best. I evaluated and owned the cables above plus many less expensive ones over about 17 years. I started out with Monster Cable Interlinlk 400 back in the 1983. For many years (5 or so) I ran the Lat Int'l IC-200D ($190) pair througout my system, even my car. I choose them because they had a midrange similar to the Magnan Vi. The LAT had better extension, especially the highs, not by alot. The bass was just a bit deeper or tighter from what I remeber. The soundstage was slightly wider, I don't remember if it was deeper. At about $190/m pair new vs. about $375/m pair used and easy to manuever, I thought it was wisest to use the LAT. Magan Vi's are cumbersome like the JPS Labs, and LAT are easy enough to use them in my car (McIntosh/MB Quart system) end to end. The JPS Labs just opened up the midrange with so much more life like size, or type of detail over the LAT. It was like going from a 20" to 32" wide screen TV in the mids. The soundstage improved, but not in the same proportion. I had to think about spending about $375/m pair used vs. getting about $85/m pr used on the LAT old cables. I ended up using my LAT in other systems(girlfirend and nephew). My point is that I could justify this expense with the caliper of equipment I currently own. At $700/m pr, I probably would not have upgraded the cable on my tuner, due to the lack of extensions and varying station source quality. At a used price the warm and open midrange detail was worth it. I listen to mostly jazz, then pop rock (Clapton, Lovett, Santana, ect. ), and some classical music. The only drawback I found in my system is that the highs sound a little soft on many CD's, but on the right ones the extension is there and just right. I am not sure if that is a Wadia unforgiving reality function, or soemthing with the tubes or tube equipment that I use. I play many audiophile CD's (MFSL, Mapleshade, XRCD, etc.) I heard the Wadia 860X in a demo with Krell (SS) amd some expensive mini monitors, then BAT (tube) with some $9000/pr speakers using the Transparent Audio interconnect and speaker cable. I agree with other reviews, that you need to spend much more on Transparent list price vs. JPS Labs list price, to get similar sound. The main point I want to emphasize is that if your assocaited equipment justifies the interconnect cost, the JPS are well worth it. You can see by the views the less expensive little brother has many more reviews, and is probably used in more affordable (than my system) but still great sounding systems. My cable comes with 10ft long balanced interconnect that runs between my pre-amp and power-amp. This cable is just phenomenal and beyond my belief. Ii lets you hear absolutely nothing but music and I can go on and on saying all the great things about it but here is my message to my fellow audiophiles out there, if you can afford it, then this is thee one. My hat is off to JPS.